*Whisk all ingredients together until combined. Cook over low heat making sure to use a wooden spoon to stir consistently 4-5 min. The mixture should have lost its stickiness and be the consistency of flubber before removing from heat. Work the flubber between both hands for a few minutes until it is soft and smooth. 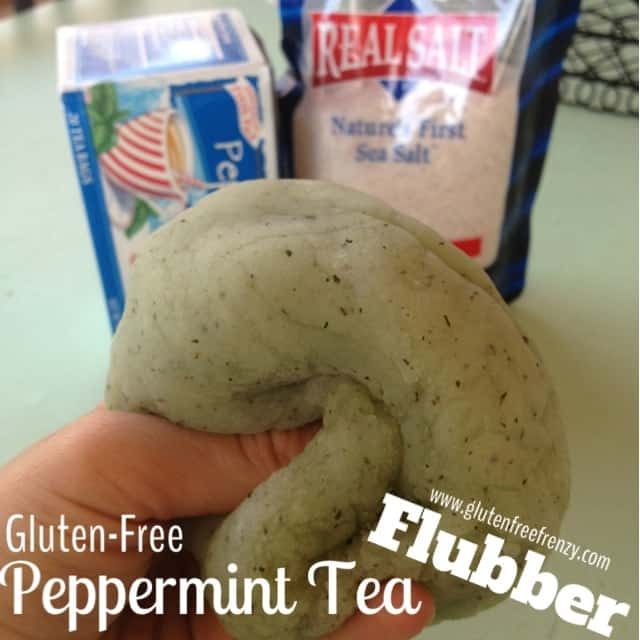 Cool down and let kiddos have a blast playing with this safe, gluten-free flubber! Note: You can keep in plastic bags at room temperature. Not sure what I did wrong. We followed the instructions, but at 4 minutes it was still watery & I had to double the time. It’s cooling now, but it’s still very sticky. I was just wondering when you added the peppermint tea?